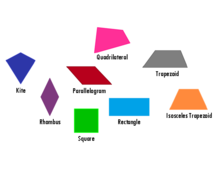 Quadrilaterals: Always, Sometimes, or Never True? A parallelogram has two pairs of parallel sides. A square has 4 right angles. A rhombus has four equal sides. A quadrilateral has interior angles that add up to 360 degrees. A square has four equal sides and four right angles. A kite is a parallelogram only when it is a rhombus. A rectangle has two pairs of equal sides. A rectangle has four equal sides. A parallelogram has one pair of obtuse angles. A quadrilateral has two obtuse angles and two acute angles. The opposite sides of a kite are parallel. A trapezoid has one pair of equal sides. A trapezoid is a rectangle. A kite has 4 right angles. A trapezoid has no parallel sides. A quadrilateral has at least one rounded side. A rectangle has one obtuse angle. A quadrilateral has 4 acute angles. A quadrilateral has less than 4 vertices. A rhombus has three equal sides and one unequal side. A square has one pair of obtuse angles.